I also like how versatile this recipe is. The meat is supposed to be Portuguese chourico, but good luck finding that. If you do find it, tell me where. I like to use chorizo. It’s pricy, but the flavor is amazing. Kielbasa or sausage are decent substitutes. If you use chicken sausage or some other “lite” variation it’s not going to be as good. (But you knew that.) And if you don’t have any kale, spinach or some other similar green is a great substitute. If you have any friends in Boston right now you should share this recipe with them. (Shout out to my Boston friends!) A good soup might make the two feet of snow predicted for this weekend seem almost bearable. Almost. 1. Heat oil in a deep pot over medium high heat. Add potatoes and onions, cover and cook 5 minutes, stirring occasionally. 2. Prepare the kale by rinsing thoroughly and tearing the leafy portions from the stems. Tear into bite-size pieces. Discard stems. 3. Add garlic, bay leaves, and kale to the pot. Cover pot and wilt greens 2 minutes. 4. Season with salt, pepper, paprika, and garlic powder. 5. If you do not have broth on hand, use 4 tablespoons of Minor’s or Tone’s chicken base or 2 tablespoons of Knorr’s bouillon granules. 6. 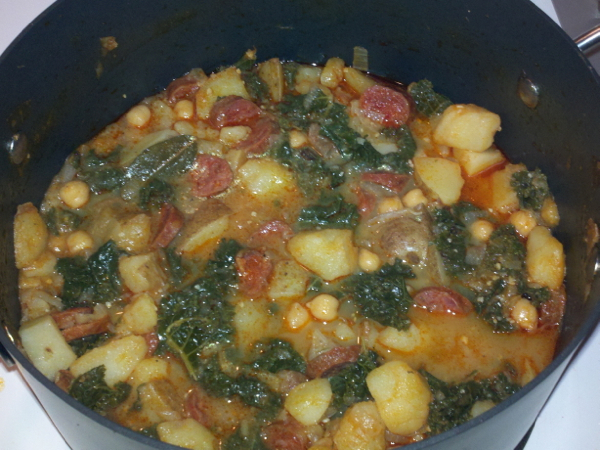 Add beans, chorizo, hot pepper (optional) and broth to the pot and bring soup to a full boil. Reduce heat back to medium and cook about 30 minutes longer or until potatoes are tender. Bio: WPSU-FM News Director and Reporter. Daughter to a food-obsessed chef. Learning to cook on my own.